I believe that parents who raise children diagnosed with special needs are a lot like the rock stars of the parenting world. We are a lot like Bruce Springsteen. In the early years, Bruce Springsteen was a skinny, scruffy teenager living in New Jersey. He was defiant, rebelling against his religious upbringing and the social dogma associated with high school. Former teachers have said he was a "loner, who wanted nothing more than to play his guitar." He completed high school, but felt so uncomfortable that he skipped his own graduation ceremony. I am sure at some point in his life his parents had nightmares of retrieving their son's body from the city jail or perhaps even the local morgue. How is it then, that this young man was able to achieve greatness? His words resonating with folks from all over the world? Now, I am no Einstein, but I believe that his success....not his "fame" or the "I am the most popular man on the planet" success but his "ability to relate to others" success...originates from an energy that comes from somewhere deep within him. If you are a Springsteen fan, you know his song lyrics are more like poetry, an honest reflection of his pain. 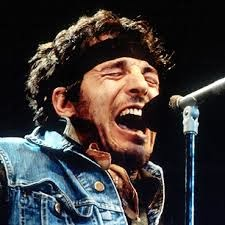 He uses "more words in some individual songs than other artists use in whole albums"
In the recording of his album "Born to Run," Springsteen battled with anger and frustration, saying he heard "sounds in his head" that he could not explain to the others in the studio. 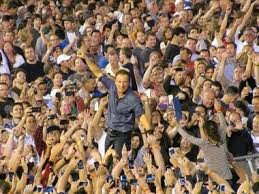 Concert-goers have likened the "Boss" experience to a spiritual awakening. He does not question the origin of the voice in his head but instead expresses it, exposing the true essence of his soul. This heartfelt expression creates a type of energy that has a powerful attraction to those who are also willing to bare their souls, celebrate their suffering and in the process begin to heal themselves. I believe "soul" energy is a very powerful thing. It is what connects us as human beings. We are drawn to its purity. I believe there are many other folks in this world who also possess this unique ability to become in sync with their soul. They are poets, writers, athletes, physicians, scientists. mathematicians and yes even special needs parents. To me, what is unique about Bruce is his ability to be present. He is in the moment. His spirit is not confined within walls. Laws and rules have no meaning. And for Bruce Springsteen, the "IS" is always changing. 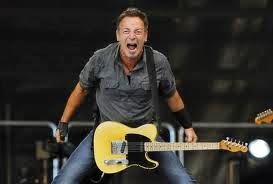 In my quest to embrace special needs parenting, to me, it is all about becoming Bruce Springsteen. When you are the parent of a child diagnosed with disease, your ability to assist your child is directly related to your ability to be present, to truly "see" your child. It is about having the courage to create a new normal. It is about listening to that voice. It is about embracing and implementing change. Can you see the spirit that lies beneath your child's disability? Can you discover the shining life energy that is difficult to see in a child who cannot walk, talk, write or behave? Without speaking, can you connect with this energy? Will you love this energy, unconditionally? Can you enable and free it? Teaching others to see it too? Are you brave enough to feel the brutal pain of raising a special child. Can you describe this pain honestly to others feeling free to expose the nakedness of your soul? Is it in you to defy laws, rules and the expected way of doing things to create a new normal? Do you have the power to be yourself and understand what makes you special? Can you create your own unharnessable energy that has a powerful attraction to those who are also willing to bare their souls, celebrate their suffering and in the process begin to heal? Can you see that which connects us all? Knowing that we are all born to run. This was such a powerful post and one that resonates with me this week; especially considering that I am going to see The Boss in concert this Saturday night! Can I see the spirit that lies beneath my child's disability? Yes, without a doubt. I am always so surprised at the synchronicity we experience in this community! Such a connection here.That is so great you get to see the Boss. Enjoy the spiritual ride. I will be thinking of you.